Hi, my name is Bentley and I LOVE people! I was rescued from the puppy mill just a few short weeks ago but I’m very well adjusted and am getting along great in my foster home. I get along with my pug siblings, my human siblings (13 year old twin girls and my 16 year old brother) and we also have a cat. I don’t bother her and she doesn’t bother me and we like it that way! I immediately loved attention and I still can’t believe my amazing good fortune of being allowed to sleep in bed with my people and pugs. Most mornings I don’t even want to get up because I am sooooo comfortable! My foster dad says there isn’t enough room in the bed for all of us but I don’t see any problem with it at all! My foster mom works nights so us pugs love to sleep in bed with her during the day. I love exploring the yard and laying in the pug pile with my three foster pug siblings. I don’t see very well and at first I ran into a few things and took one tumble down the stairs. I am adjusting very well now that I am learning where things are. I go up the stairs just fine and we are working on going down the flight of 15 stairs. I have mastered the 3 steps from the porch to the yard, both up and down. My foster mom says I’m doing so well that sometimes she forgets that I don’t see that well. I am doing pretty good with housetraining. Mom says I was easier than most because since I don’t see that well, I didn’t know when people were watching me and I would get caught in the act, so I learned pretty quickly that they want me to go outside to do my business. 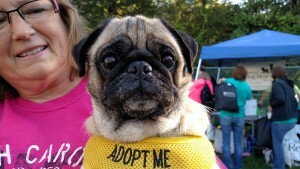 I am a very happy pug and I am very grateful to have been rescued by Pug Partners. I have a silly, delightful personality and my mom says I am going to make my furever family very happy when they find me!! 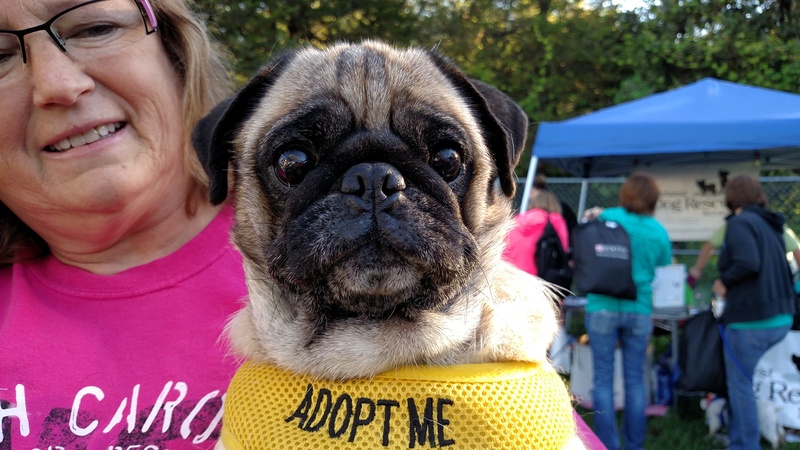 Interested in adopting Bentley? 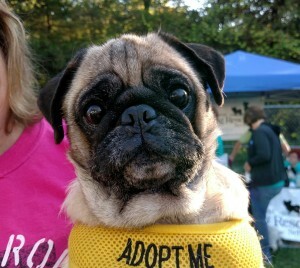 Please see our website and fill out an application at: www.pugpartners.com/adoption-application Bentley’s minimum adoption donation is $350.